This short blog explains how you can create calculated formulae for fields in an SQL table (known as "computed columns"). This blog is part of our much longer online training series on SQL (or have a look at our courses in SQL). Thanks to Kevin on my advanced SQL course last week for educating me about these! There are some tables in SQL Server which you'll always do the same calculations on. Here are a couple of examples. The full name is the first name, plus a space, plus the last name. To avoid having to keep typing in the same formulae over and over again, you could embed it ina a user-defined function or a view; but you could also include it within the table as a computed column. The gross is automatically calculated. 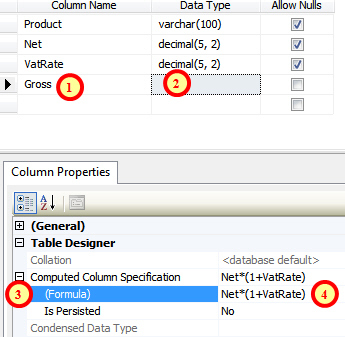 Note, however, that you can't use an UPDATE or INSERT statement to change the value of a calculated column (nor should you expect to be able to do this). You can't specify a data type for a computed column - SQL will work this out itself. Thus if you're going to be inserting or updating data a lot but not then querying it much, don't persist (the default); but if you'll hardly ever change data, but frrequently query it, set Is Persisted to Yes.